By exploring the offers, I am forced to admit that Trail Tech Voyager Pro doesn’t have real competitors in the off-road GPS market today. Maybe it’s too convincing, but it’s my personal opinion that someone might disagree with. In this Trail Tech Voyager Pro review, I will try to justify my assumption. For what Trail Tech Voyager is, you can read here or go to the company’s homepage at once. What does this device offer other than similar devices? In fact, here’s almost everything needed for comfortable and safe driving outside the highlighted roads on conventional GPS road maps. For the most part, this device is used to drive on previously marked trails or to create such off-road routes and trails. So, what is needed for comfortable and safe driving with any kind of off-highway vehicle in terms of navigation and how much does the Trail Tech Voyager Pro match? How do we get from point A to point B? So, we want to go around the terrain where the normal turn by turn navigation does not work, simply there are no roads or streets. How do we get from point A to point B? If the area is more or less known, we can make our way and drive in memory by looking at trees, rocks or other known orientations. In most cases, we will reach the destination sooner or later. Since almost everyone has a smartphone with GPS and Google maps, in theory, we will know the location even if we have to get lost. Here I would like to repeat and warn that blindly trusting only to the phone navigation is a completely unacceptable act. It is very likely that in extreme circumstances use GPS applications will be uncomfortable and even impossible, especially if your ATV or snowmobile is not specifically equipped to operate the $1K worth iPhone safely. I’m sure most off-road drivers have found out about it in practice. The phone can always be a backup tool, though, because the App Store and Google Play stores are full of many good apps and not so good ones. Remember that you are not driving a comfortable car where you are warm and always have 12V to charge your GPS device and phone. If we want to enjoy and move safely off-road, we clearly need a trail or a path to follow. The Trail Tech Voyager Pro is meant for it. Here you can load already ready ATV trails, or you can create them for yourself and share with friends. It is the main function that this apparatus is different from the conventional GPS device and is also performed by the old Trail Tech Voyager device. Is twice the price worth buying a Pro version? In two words I would say yes. Trail Tech Voyager Pro GPS has many additions and improvements that directly affect more comfortable and enjoyable off-road driving. Since it has been about half a year since the device has appeared on the market, there is also relatively many real users’ feedback available. So, we can assess both the pros and cons. Before we dive in pros & cons the short product description taken from Amazon. 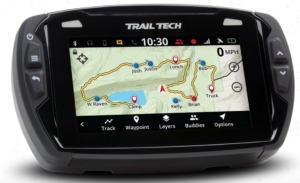 “Trail Tech Voyager Pro, the Connected Rider’s GPS. The map screen is enabled with base maps, topography lines, hill shading, and trails. Record or load GPX trails and riding areas, and transfer to a PC using the MicroSD card. Voyager Pro comes loaded with North American maps, but other map regions can be downloaded for free. Sounds great, right? Are these functions all so needed? I think there may be situations where any of the features listed can be used. I won’t go into every one of the listed benefits of Trail tech Voyager Pro GPS but stop at what real users say. I’m going to start with the most important thing in my opinion, about GPS trails. How to get ready trails and how to create them by yourself? I don’t have much to add about already-ready GPS trails, they are available in many places. Trail Tech homepage offers a relatively wide range with ready-to-wear GPS trails for about $20 per micro SD card. You can also get them from other drivers or the local off-roader Society for free. If you want to create trails yourself, one way is to record their device memory while driving, or even when you’re sitting at your computer at home. One of the shortcomings users are concerned about is that the format of trails is possible only as GPX file. The easiest way to create the GPX trails is visiting Rideleader’s home page. It is straightforward to create and very convenient to download a trail on the SD card on the Mac and Windows PC and then to your Trail Tech Voyager or any other GPS navigator that supports GPX files. For those who worry that you can’t use Google Map or Google Earth to create trails for Trail Tech Voyager use, it can be done relativity simply by converting Google Map link to GPX file. In my opinion, this is simply done without any specific knowledge. So how and where to get GPS trails is clear. Regarding cartography, it should be added that many of the old Trail Tech Voyager GPS users were not quite satisfied with the fact that there was no base map. The new Pro version has a great base map not only with U.S. coverage but it is possible to load many other countries for free, including some parts of Europe. Base maps are excellent, and it has a Perspective GPS view feature which is missing for many other GPS units. I forgot about the lack of the possibility of renaming the names of the trails and changing the colors. I think this might sometimes cause some confusion, but the manufacturer seems to be working on it. It would be a bit of trails and maps, but what else would be new and noteworthy for the Pro version? Buddy Tracking, what it is? As mentioned in the description, it is an opportunity to communicate with one another between drivers who are also equipped with Trail Tech Voyager Pro GPS devices. At first sight, it might seem to be nothing worthy of attention, but I don’t think so. It is an FM radio communication, like a VHF walkie-talkie. You can contact up to twenty members of the group and even see them on the screen of your device. The range is about a 5-mile radius, which though depends on the environment and can fluctuate, hills, valleys, forests, etc. Maybe you’ll say you’d better use cellphone? This is even practically possible because the device is equipped with Bluetooth and can be simply connected with one of the appropriate intercom devices in your helmet. On the screen, though, you won’t be able to see your companion, and you won’t be able to communicate with the other twenty company members at the same time. And how about areas where there is no GSM coverage? Definitely, a good feature if others have Voyager Pro units as well. As I have said, this device is equipped with Bluetooth so that you can listen to your favorite music and communicate through the intercom with the passenger, as Trail Tech Voyager Pro GPS Bluetooth has a feature to connect with two users at the same time. Although I’m not going to listen to music when riding on the bumpy mountain tracks but, especially for the younger generation, it could be the relatively enticing advantage. Finally, the ability to connect Pro to the engine measuring devices by using standard Voyager sensors. Which makes it possible to see on-screen both the speed, ambient and engine temperature of the engine and the surrounding environment, as well as RPM, battery voltage and distance traveled. If you have any of the Trail Tech devices, then sensors fit for the new Pro version device either. I guess that for some riders it is an important indicator to consider when you are about to buy a Pro version. The display is glove friendly and the visibility is great in any condition. Some talk about missing button control, but most real users say that operating with new color touchscreen TFT display is just perfect. The docking solution of the device is very important. There are different thoughts on this issue. Some users say that, e.g., Garmin Montana 650 has a better holder, but the Trail Tech Voyager Pro device may fall out while driving in extreme conditions while others say that a holder is excellent and the unit fits in it good. Durability withstands the harshest elements and device is rated for IP67 for anti-dust/water intrusion. Battery capacity is also frustrating for some, about 40 minutes, depending on what is used so do not go for the ride on the vehicle without battery. Apart from cycling though, I don’t even know who doesn’t have a battery. Trail Tech Voyager Pro GPS withstands low ambient temperatures, but how low, that’s what I can’t say. For snowmobile users, however, I would suggest thinking about some kind of heating option. You can read a little about it here. I have experience in the use of different electronic devices in the cold and do not know any which correctly operates at low temperatures without additional warming. That is briefly what I wanted to say about this device. 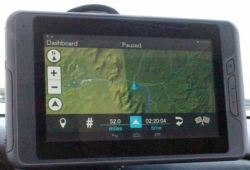 In my opinion, the best on the market for off-road GPS for today. Although the price of Trail Tech Voyager Pro GPS is relatively high, using it will offer additional opportunities and satisfaction. Previous Previous post: Perfection and Elegance of Seiko GPS Solar Watches. Next Next post: What Is the Mavic 2 Zoom? Trail Tech Voyager Pro sounds like a really new device to me. I have not heard about this device until I read this article today. After reading your experience with this device it looks like this is an really useful and safety worthy device that anyone can depend on. Thank you so much for sharing so much information about his wonderful device with us. Thanks for the comment. The new Trail Tech Voyager Pro is really a great GPS navigator if you think to go off-the-road. I was searching through your site for a GPS system that I could use in off-road mountain biking, but after reading your review on the Trail Tech Voyager, I see that it’s probably not the best choice for bikes…would I be right in saying so? I’m wondering about the device’s dimensions and it’s durability ‘outdoors’ and not inside a vehicle. What GPS would you recommend for mountain biking and have you covered one on this site maybe? Glad to see you, Chris, again. You’re right Trail Tech Voyager Pro won’t fit for the mountain bike. The main problem here isn’t Pro dimension, but the fact that the battery holds for about one hour and usually bike doesn’t have an additional battery. For a mountain bike, I would recommend a Garmin Edge 250. There is also this one from Magellan 505 GPS. Thanks for the idea of new research on GPS for mountain bikes. Hey there! How are you? I’ve really enjoyed reading this article on “Trail Tech Voyager Pro” as it’s informative. I bought a Trail Tech Voyager Pro GPS a couple of weeks back and I must say that it’s definitely worth every single penny as its affordable and provides you with tonnes of features. The mean thing I look for when I busy something like this is cost and fearures. An other plus point is that it’s very easy to operate. Hello. I have the real pleasure of reading feedback from the real users of Trail Tech Voyager Pro. Again, you confirmed my assessment of this great off-road device. Interesting post dear.To be frank it is my first time to hear about this Trail Tech Voyager Pro the Best GPS for OFF-Road Trails.I was passing through this post and I fond how useful is this device. I can recommend this device to truck drivers who drive long ways because they could not be bored as this device has the bluetooth they can download their favorite music and enjoy the drive. Hello Julienne. Thanks for the comment. I think there would be more useful for truck drivers look for specially designed devices. You can read here. Some time back I was hearing about the news that Trail Tech Voyager Pro will be launched anytime but I lost track due to other preoccupations and was not aware that it has already been launched. Thank you for making us aware. Also your review article is very detailed and I must congratulate you for a work well done. I fully agree with you that one must not put all his dependency on google maps app available on his phone as you never now when it will ditch you. I personally have suffered more than a couple of times. At the best the google maps can be used as a fall back option and not the primary one. Thanks for the comment. 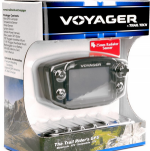 I have to admit that the new Trail Tech Voyager Pro GPS is quickly gaining popularity. As confirmation of this, I can say that it has already been purchased by three people through my post, although it was only published a week back. I want to see Trail Tech Voyager Pro in the near future. I do use my smart phone for GPS but I do believe a gadget separately and intended made for this purpose can be advantageous over other gadgets such as smartphones. Maybe the price will go down after sometime the gadget will permeate every place so it will be affordable to the majority consumers. Hi Abagatan. Using a smartphone in the car as a GPS navigator is sometimes dangerous from a safety point of view. Many talks that they are just listening to the turn by turn directions, but sooner or later, the eyes are thrown not only on the route on display but on messages or Facebook notifications as well, and then it distracts attention from the road. When we talk about price, it is a very relative indicator. If you can afford snowmobile for $10K, then $600 for a great assistant for both convenience and safety doesn’t have much. Hi! Thank you very much for endorsing this device. Your recommendations have always been very useful to me! I sure agree with you, traveling through areas that are not covered in the cartography loaded onto our GPS device can really cause us a lot of stress. Having ATV trails available can make any trip off-road a pleasant experience, removing the anxiety of getting lost. Buddy tracking is also a super cool feature! I have gone on expeditions where we’re going in a group of 3 – 4 cars and we’re riding off-road trails. Being able to be in touch with all the cars at the same time and viewing their position on our device, would be very much appreciated! You are absolutely right, Henry. It’s just that you can have visual control over other drivers and not negotiate with them is a big advantage of this device. Great information and the video in particular is well-done and packed with great information about the product. Do you think someone will come in a challenge Trail Tech in the future or would it be pretty safe to purchase one now and not worry about it being badly outdone in the near future? Thanks, Mike for the comment. I think the market for off-road GPS devices is relatively unoccupied and that other brands will continue to develop them as well. Trail Tech Voyager Pro is a great device and the pleasing news is that the price has just been lowered somewhat. Maybe it’s about Christmas, but it’s a pleasure anyway. Hello Maria. You’re right, Trail Tech Voyager Pro price is falling. I hope it’s not just a Christmas discount. Trail tech voyage pro sounds like a great device. For any hunting enthusiasts, snowmobiling or recreationalist. It sounds like it has really made some advances just for the time it’s been on the market. It would have definitely came in handy back when I did some off road driving back in Colorado. I really appreciate the video, you did a great job with that. Thank you for the post, I really like it. Thank you for this great and unbiased review of The trail tech voyage pro, I find it really informative and mind blowing. Am so gutted that this device doesn’t isn’t fit for mountain biking,well I will recommend this to all truck drivers out there because this is the best off road device I have ever read about. Thanks for stopping by. You are right Trail tech Voyager Pro not the best choice for mountain bike mainly because of lack of power supply as a device’s battery is not for the long run. For engine driven off-road vehicles, this is a great choice. Although the price is high as you said but Trail Tech Voyager Pro GPS has one feature I love most the fact that it has the standard Voyager sensors which can measure the speed, battery voltage and distance travelled. I would advice anyone going off road should go with and I won’t advice mobile GPS on Off road. Thanks a lot for this post. Trail Tech Voyager Pro has all the features I need. Thanks for taking time for the comment. It is true that relying solely on the smartphone navigation of the while driving with a snowmobile is not wise in unfamiliar terrain. In the cold, the phone’s battery discharged very quickly and you risk staying without a landmark. It is not safe. There was a lot I apparently did not know about GPS even having made use of some of them. I can say that I have become more enlightened by reading this post. For starter, I never knew that a GPS trail could actually be created by an individual. I always thought it was done by the company in which the GPS was purchased from. Is this method of GPS trail actually safe because some individuals might create the wrong trail?. The GPS Trail Tech Voyager Pro sure is amazing. It does seem to have some amazing features that other GPS tracking devices don’t have and one of my favorites is the buddy tracking. It is truly amazing. Thanks for stopping by. You are right that GPS trail for ATV or any other off-road vehicle maid on the computer can be created incorrectly. From the very beginning, I recommend starting with short-range tracks and be sure that your fuel tank is filled up to return your starting point if you’re lost.